Readers can browse by author, topic, title or open this book to a random page beginning a worthwhile journey to draw inspiration, courage, and understanding. Some essays are from first-time writers with obvious writing weaknesses that reflects Santana’s purposeful choices, which might promote these authors and could nurture their future works. All these stories are worth telling and maybe we will see book in the future from Santana based on events related to this book. These chosen works are also very positive and practical. Simply titled essays like “Escape from the Cambodian Killing Fields” by Tammy Thea and “Prison Parenting” by Rhonda Turpin can still impact readers in unpredictable ways. No experience is ever a given among several other quality essays that offer different compliments, enhancements, and resulting emotions. Readers should set aside time for reflection after each reading session since each piece offers such a different experience. 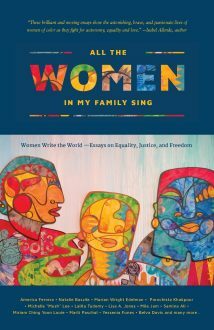 This entry was posted in Book Reviews and tagged All the Women in My Family Sing, Books, Deborah Santana, essay, Michael Siebenaler, Mike Siebenaler, poem, poetry, Tall Writer. Bookmark the permalink.